Schalke 04 picked up the next three points in a week and celebrated an important victory as they beat local rivals Borussia Dortmund 2-1 in the Revierderby. The next winless game gives Jürgen Klopp worry lines. For Schalke, Joel Matip played as centre-back instead of the young Kaan Ayhan. As no. 6s Marco Höger and Kevin-Prince Boateng started, with Boateng having a vertical role. It came as no surprise that Boateng tried to move forward while he wanted to provide connection between defence and offense. Ahead of them, Max Meyer played as the no. 10. The 19-year-old hat quick movements when drifting between the lines of Dortmund; he gave his team a quicker rhythm and was an anchor in midfield. On the right Sidney Sam started, while Eric Maxim Choupo-Moting played on the left looking to move inside from wide areas and use his dribbles to create chances. Up front Jens Keller fielded captain Klaas-Jan Huntelaar. The Dutchman had only a few ball contacts but a huge work rate offensively. He tried to make vertical and diagonal runs to tear Dortmund’s back line apart. Jürgen Klopp surprised with the starting XI as he benched Shinji Kagawa and deployed a 4-2-2-2. Sven Bender and Matthias Ginter are classical holding midfielders, and both played in front of the back four. It also was a consequence of Dortmund’s injury list, with the likes of Nuri Şahin, Oli Kirch, Sebastian Kehl and Henrikh Mkhitaryan out for weeks or months. The creative centre is enfeebled by these injuries. Neven Subotić and Mats Hummels started as the centre-backs, while Łukasz Piszczek and Erik Durm played as the full-backs, both got forward a lot but Piszczek did so especially. He attacked outside and Pierre-Emerick Aubameyang drifted situationally into the centre spaces. Kevin Grosskreutz started on the other wing; both Aubameyang and Grosskreutz were asked to move inside with their dribbles. However, Bender and Ginter remained deep and it was difficult to combine in the final third. The new signings Adrián Ramos and Ciro Immobile began the match up front. In the first half hour Immobile oriented toward the left side, while Ramos’ positioning was fluid. The Colombian looked to link up play and make runs into the final third afterwards, but Schalke absolutely outnumbered Dortmund and both forwards struggled to receive balls. The pattern of the game was clear, with Schalke dominating the midfield and Dortmund looking to attack quickly, primarily through Piszczek and Aubameyang. However, Schalke’s early lead again resulted from a dreadful mistake of Dortmund’s defence. Joel Matip found plenty of space and converted a corner with a header. Choupo-Moting doubled the lead after a disastrous attempted clearance by Ramos. These two goals put Schalke in the driver’s seat, but there was still plenty of football left. Höger usually dropped behind the right full-back in the initial build-up. Roman Neustädter, rather a deep-lying playmaker, moved to the left side and Matip positioned himself in the middle. As Dortmund had only two forwards up front, they could not put pressure on Schalke’s build-up play. Both wingers behaved man-oriented and covered the opposing full-backs. Therefore, a big hole in the centre emerged, and Boateng picked up many balls. Thus Schalke could take control of the game pretty quickly. From the 10th minute, the home side were even more constrictive and won balls high up the wings via their counter pressing. Klopp ordered his side to defend narrow, with Bender and Ginter covering the space in front of the back-line as well as the half-spaces. This seemed to allow Piszczek to fly forward. However, Dortmund allowed Choupo-Moting many runs behind the right full-back and freedom on the ball. On the other side, Durm was less advanced, while Sam played extremely narrow. In Contrast, Meyer was useful in possession because Dortmund’s press was not intense. The front two often closed down the centre-backs, then no-one was backing up to shut down Schalke’s holding midfielder or no. 10, and the Royal Blues enjoyed longer spells of possession than expected towards the middle of the first half. 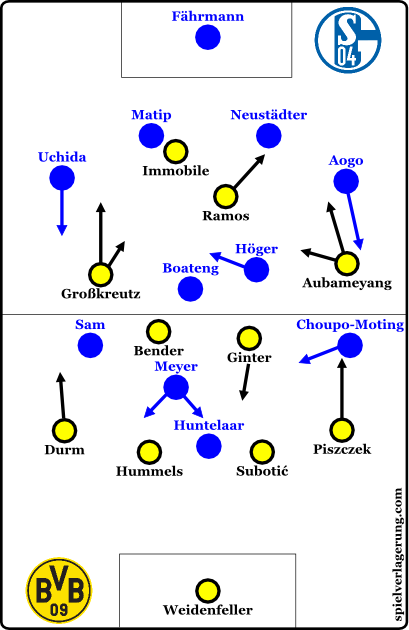 With Schalke playing a narrow midfield, the obvious route for Dortmund to attack was down the flanks. With Kagawa on the bench, Dortmund had only two wide players in midfield – both Aubameyang and Grosskreutz instinctively take on opposition full-backs down the outside. In other ways, Dortmund played the ball directly to Ramos and Immobile, but both had problems to find space during the first 45 minutes. Dortmund did not transfer the ball quickly and properly enough, with Schalke’s midfielders moving across effectively to shut down the space. Aubameyang was a threat on the right side, as we have become accustomed to this season, but Durm and Grosskreutz did frustrate down the opposite flank. Klopp’s side had also defensively loose echelons to put pressure on Schalke. Both holding midfielders denied vertical runs and played only easy passes. They were useful for short one-twos with Hummels in the initial build-up. For instance, Bender positioned himself in front of Dortmund’s captain and lured his man-to-man marker towards the back line. After Bender played the ball back, Hummels could find Durm on the left who was no longer covered through the coverage shadow. 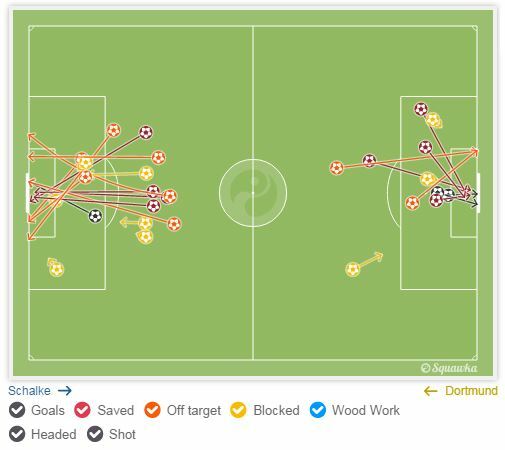 Nevertheless, Dortmund displayed a poor attacking structure in the first half. A pass accuracy of 64 percent was a clean proof. Klopp did not change his team during the half-time break. However, BVB dominated from then on. The match became one-sided as Schalke shut down the game without offering a counter attacking threat. After 57 minutes Kagawa came on for Immobile and Dortmund changed to a 4-2-3-1. The Japanese showed impressively his ability to pick up balls between the lines. Kagawa was the needed needle player in this instance. Meanwhile, Aubameyang switched to the left side and he sometimes overloaded with Ramos. But Schalke played a narrow 4-5-1 and protected the lead to the end. Basically, Dortmund lost this game with two individual mistakes. But besides that, Klopp’s approach did not work. It is important to remember that his side is suffering from severe injury problems, and maybe Kagawa was too exhausted to play from the beginning in the Revierderby. However, with the likes of Mkhitaryan and Reus side-lined, he would have been the key factor in the attacking structure. Bender and Ginter can clean centre spaces, but cannot create attacks. Moreover, both forwards could not harmonize together and altogether it was utterly ugly to watch. In contrast, Schalke not only won the prestigious Revierderby, Keller’s side is on a tear. His tactical approach is still simple, but he set up a team to expose Dortmund’s lack of organization at the back, and their lack of pressing in midfield.